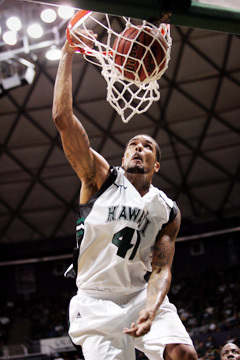 Hawaii's Julian Sensley threw down a dunk during the second half of last night's game at the Stan Sheriff Center. With Fresno State threatening to enter the zone from long range, the Hawaii basketball team countered with a zone of its own. After Fresno State got off to a hot start beyond the 3-point line, the Rainbow Warriors switched to a rarely used zone defense and slowed down the high-scoring Bulldogs enough to earn a 73-65 win in last night's Western Athletic Conference contest. A crowd of 7,100 at the Stan Sheriff Center, the biggest turnout since the season opener against Michigan State, watched the Rainbows come back from an early deficit to end a two-game skid. The Bulldogs made four of their first five 3-point attempts, prompting UH coach Riley Wallace, a staunch believer in man-to-man defense, to switch to a 1-2-2 zone. The 'Bows stuck with it for most of the game as the Bulldogs continued to fire from beyond the arc, making 13 of a WAC-record 37 3-point shots. UH, meanwhile, was able to score much closer to the basket and shot 54 percent from the field in the win. "In my first three years here, that's the first time we've actually played zone for longer than a possession," UH senior Julian Sensley said. "I don't think they were really prepared for that." The Rainbows (9-6, 3-2 WAC) held Fresno State (9-7, 2-3), the WAC's highest-scoring team, 10 points under its average as they moved into a tie for third in the WAC heading into tomorrow night's game against Boise State. Sensley led the Rainbows with 21 points and six assists. Guard Matt Lojeski knocked down three 3-pointers in the first half on his way to matching his career high with 20 points. Forward Ahmet Gueye contributed 16 points and eight rebounds. Point guard Deonte Tatum finished with 10 points and five assists with no turnovers. With Fresno State firing up long shots, UH's 28 defensive rebounds ignited the Rainbows' transition game, which led to layups and dunks. "Coach has been stressing that a lot, getting out and getting easy buckets instead of having to work for everything," Lojeski said. "Our defense keys that, once we get a stop, we get an outlet and we're off." Fresno State forward Quinton Hosley finished with 18 points and 16 rebounds. Guard Ja'Vance Coleman nailed a team-high four 3-pointers and also had 18 points. Fresno State drained four 3-pointers in the game's first 6 minutes to jump out to an 18-9 lead. After altering the defensive strategy to better cover the perimeter shooters and limit penetration to the basket, UH outscored Fresno State 15-3 over the next 7 minutes to leapfrog ahead. UH hadn't practiced the zone until Friday afternoon, but it seemed to catch the Bulldogs off guard, as they went 2-for-11 beyond the arc the rest of half. "It was unbelievable the energy ... that was in that zone (in practice)," Wallace said. "The matchups were perfect, the guys got there for the most part. ... It didn't give them the penetration, which means they're not going to the foul line." The teams traded the lead eight times over the final 5:30 of the first half and went into the break tied at 33. The Bulldogs appeared to regain their touch early in the second half and led 43-40 when Hector Hernandez drained Fresno State's third trey of the period at the 16-minute mark. UH then went on a 15-0 run and led 55-43 after Sensley converted a behind-the-back feed from Hiram Thompson into a dunk, then drained a 3-pointer from the top of the key on UH's next possession. "The second half, we just had some breakdowns on both ends of the floor," Fresno State coach Steve Cleveland said. "We had open looks at the 3, but it didn't go down. We just weren't able to get anything consistent inside." Halftime -- Hawaii 33, Fresno State 33. 3-point goals -- Fresno State 13-37 (Coleman 4-13, Hosley 3-6, Hernandez 3-6, Morris 3-9, Bell 0-3), Hawaii 5-15 (Lojeski 3-7, Sensley 2-5, Gipson 0-1, Tatum 0-2). Personal fouls --Fresno State 16, Hawaii 10. Steals -- Fresno State 5 (Hosley 2, Morris, Hernandez, Coleman), Hawaii 7 (Lojeski 2, Sensley 2, Gipson, Tatum, Botez). Blocked shots -- Fresno State 1 (Morris), Hawaii 6 (Gipson 2, Gueye 2, Sensley, Botez). Turnovers -- Fresno State 11 (Bell 3, Morris 3, Hosley 2, Coleman 2, TEAM), Hawaii 10 (Sensley 4, Gueye 2, Thompson 2, Lojeski, Botez). Officials -- McCall, Burks, Lehigh. A -- 8,617.